Named as a Christian Science Monitor Best Book of 2002, Ethical Ambition is now available in paperback. As one of America's most influential law professors, Derrick Bell has spent a lifetime helping students struggling to maintain a sense of integrity in the face of an overwhelming pressure to succeed at any price. 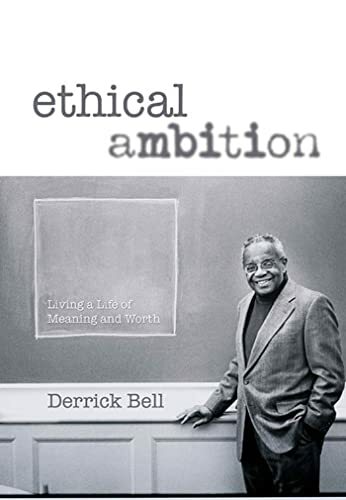 The result of a meditation on Bell's own achievements, Ethical Ambition is a deeply affecting, uplifting, and thoughtful work that not only challenges us to face some of the most difficult questions that life presents, but also dares to offer solutions. Derrick Bell is one of the most highly respected constitutional law scholars practicing today. He teaches at the New York University School of Law, and is the author of seven previous books, including The New York Times bestseller Faces at the Bottom of the Well. These three books take different approaches to the basic question, How can we live a meaningful life? To find an answer, Vanier (Becoming Human) turns to Aristotle, offering a detailed account of his views on the virtues. Vanier shows that Aristotle based his ethics on a cultivation of individual excellence that did not exclude the values of friendship and life in society. Vanier does not, however, wholly embrace Aristotle, arguing that his system was elitist and needs to be corrected by Christian compassion. Like Vanier, Kekes (The Examined Life) emphasizes the virtues, but his approach to the good life is pluralistic rather than Aristotelian. Arguing that no formalist doctrine such as Kant's can provide universally valid rules for leading a moral life, he instead maintains that the study of admirable individuals furnishes the guidelines we need. Among those Kekes finds worthy of emulation are Montaigne and Thomas More, who balanced public responsibilities with private commitments. Kekes offers a close analysis of their conduct, thereby hoping to convey a sense of how choosing a personal ideal is influenced by general moral constraints. Bell suggests a more personal way of addressing life's meaning, discussing incidents in his own life that may help others find an answer to this question. In particular, he stresses his need to subordinate personal ambition to the Civil Rights Movement. His principled stand involved him in several crucial conflicts, one of which led to his resignation from the faculty of Harvard Law School. (He is now a visiting professor at NYU.) Bell also presents insights on his friendship with women and on religion, again from a personal perspective. These three books are highly recommended for all public libraries.